Just in time for the holiday rush, Discover announces its online mall has just added many new incentives when you choose this credit card network. At the time of this writing, more than 70 of Discover’s partners have come together to offer additional cashback bonus rewards for customers who shop online through the Discover website. These offers are good through the holiday season and the 70 partners could easily grow to include more of Discover’s 200 retailers. With all of these great new incentives, we thought it’d be a good time to take a look at a few of the many Discover credit card offers. Most have no annual fees and many have perks other card networks have abandoned in recent months. This is a unique co-branded credit card offer between Discover and Restaurant.com. It offers several ways to save – and earn – money along with a $150 Restaurant.com gift certificate after your first purchase. You can keep it for yourself or give it as a gift. You’ll also appreciate the absence of an annual fee as well as no rewards redemption fees. Also, the bonus points categories rotate every three months, which allows for great savings throughout the year. Enjoy online account access, double cash rebates at participating merchants and the ability to transfer your balances. Motiva is a great choice for Discover users, though it’s not as well-known as its More and Escape counterparts. It has as many perks and benefits, including a 15 month 0% APR for both purchases and balance transfers, a guaranteed “60 second or less” wait time for a U.S. based customer service representative, no annual fee and all the protections offered when use you a Discover product. It’s consistently ranked high in customer satisfaction, as are all of Discover’s products. As of September 1st, Discover More card users have been earning up to $300 cash back on purchases made in department stores, clothing stores and restaurants – all three of which we use during the holiday shopping season. Not only that, but the 6 month 0% APR intro rate applies to both balance transfers and purchases. There’s a $100 cashback bonus, too. Want to save even more? Use your Discover More card to take advantage of 20% cash back bonuses online – as well as those additional perks just announced. 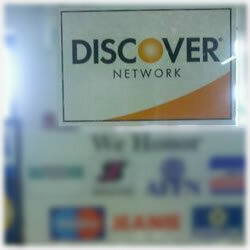 You’ll also enjoy the Discover $0 fraud liability, around the clock access to customer service and no annual fee. It’s an all around great offer, though you’ll want to carefully review the terms and conditions to ensure it’s a good fit for your specific needs. For those who are heading into college or are getting ready to shed their collegiate selves and enter the workforce, the Discover Student Monogram Collection is a fine way to get your finances lined up with a 0% intro rate for purchases, no annual fee and after the 9 month intro expires, these students (or former students) will still enjoy a lower APR. Card holders earn up to 20% cash back at various retailers, and again, if you shop through the Discover website, you can take advantage of all the holiday bonuses, too. Need an additional card? There are no fees associated with those additional cards, which is perfect for newlyweds. One of the newer Discover offers, there’s a lot to this credit card. Double miles for every dollar spent, no travel restrictions – including your choices in airlines and hotels – and the flexibility in redeeming your rewards are just a few of the benefits for Escape users. It’s versatile, offers a low interest rate and for the first six months, you’ll enjoy a 0% APR. There is an annual fee of $60, but this is definitely an offer worth consideration. Part of the reason Discover maintains its top spot in customer satisfaction is the absence of the controversy that’s surrounding other bank cards. For Discover, it’s all about the streamlined dynamics that keeps customers happy. While it’s important to always read the terms and conditions associated with any card offer, Discover has consistently kept its consumers happy with incredible customer service and transparent business models. Discover It or Citi Simplicity?